Despite the sands of time slipping through the proverbial hourglass, the .45 ACP is not only as popular as ever, but maybe even moreso. With the advent of polymer framed, single stack dedicated concealed carry pistols becoming absolutely commonplace, many customers are willing to trade off a round or two in exchange for a chambering that tends to stop assailants dead in their tracks. Remington Golden Sabre has been around for quite a while and has probably put down its fair share of threats in its day. Why the staying power? Because it is a quality, reliable defense and duty ammunition. 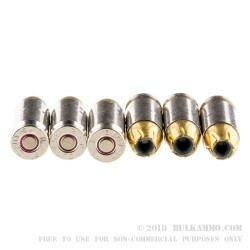 Using a bonded brass jacketed bullet, it is designed to retain maximum weight and mass when going through objects. It retains up to 97% mass when fired through automobile glass, which wreaks havoc on many lesser bullets. The 230 grain Golden Sabre offers ballistics which are comparable to most other standard pressure loads of the same weight. Muzzle velocity at the barrel registers 875 fps, dropping only slightly to 853 f/ps at 25 yards and 833 fps at 50 yards (distances which aren’t all that likely from a handgun). Energy was 391 ft lb at the muzzle, 372 ft lb at 25 yards, and 355 ft lb at 50 yards. Again, these cartridges really do a good job of retaining velocity and energy over distances far exceeding common contact ranges. Should your travels take you into dangerous territory (human history shows that to be just about anywhere, anytime), you need to outfit yourself with the best kit available. 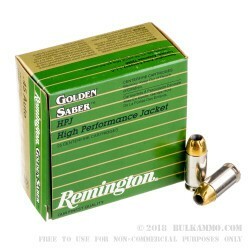 Remington Golden Sabre has proven itself up to the task, and it will go fast at these low prices. 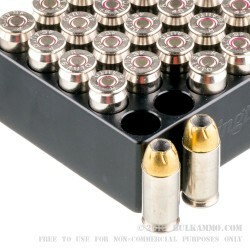 The only ammo I use! These are one of my trusted rounds that I use for home protection. Here in CO, ANY round is hard to find. 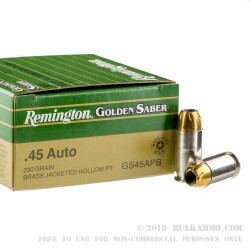 Esp 45 ACP particularly 230 gr. I was glad to come across these guys here at Bulkammo.com. And even with paying for FedEx ground and the $0.62 insurance, it was only $2 more than buying a box at local stores here. I even had a question about my order after placing it. And they were professional in answering the question and had tact and candor in answering me. It was refreshing, and I appreciate. And I am glad that there are still companies that exhibit this quality of service. I think I will start doing business with Bulkammo.com and totally negate past my local shops.